JAKARTA, INDONESIA--(Business Wire / Korea Newswire) August 10, 2018 -- A magnitude-6.9 earthquake hit the Indonesian islands of Lombok and Bali at around 6.45pm on August 5th, 2018, with more than 90 people dead and hundreds more injured. The immediate focus is search, rescue and meeting the basic needs of people affected by the earthquake. To improve collaboration efficiency in the search, rescue and evacuation, Hytera donated communications devices in the first minute to Palang Merah Indonesia (PMI), the Indonesian Red Cross, and also has stayed connecting with the Blue Sky Rescue and International Federation of Red Cross and Red Crescent Societies to stand by per the nation’s request for international rescue efforts. 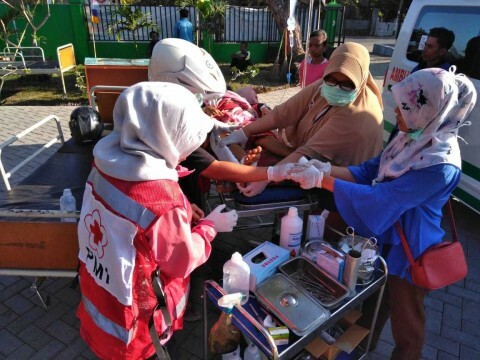 In the morning of August 6, Hytera Indonesian subsidiary in Jakarta set up a 7-member emergency response team and immediately contacted PMI, as its volunteers and staff have been providing medical support to the survivors and also helped to evacuate people from the coastal areas. After confirming PMI was in need of mobile communications support, Hytera local team soon came out with a mission critical communications solution, consisting of advanced digital two-way radios, mobile radio and repeater. On August 7, Tuesday morning, a joint meeting between Hytera engineers and PMI technicians was organized to go through the solution details and possible scenarios where the solution could be used for. At 3pm on August 7, Hytera communications devices were handed over to the PMI team, and its emergency response team were standby to provide assistance for upcoming rescue efforts. “About one week ago I saw Basarnas (Indonesia Emergency Rescue Department) was using your devices in the last Lombok Earthquake. I am familiar with your brand. When you proposed to donate equipment, I am so excited. I hope that those devices could be used into the rescue as soon as possible. Thank you for your help,” said Mr. Sunarbowo Sandi, Head of the PMI Headquarter, when receiving devices from Jerry Gao, Sales Manager ASEAN of Overseas Sales Department at Hytera. At the same time, Hytera headquarters CSR team in Shenzhen, China, contacted the Blue Sky Rescue and the East Asia of International Federation of Red Cross and Red Crescent Societies to offer necessary help once needed. Gwendolyn Pang, Head of East Asia, International Federation of Red Cross and Red Crescent Societies, said, “I was informed that yesterday that Mr. David Yang, a Hytera Regional Marketing Manager from Shenzhen, delivered 50 handsets, 1 mobile radio and 1 repeater to the Indonesian Red Cross office in Jakarta. The International Federation of Red Cross and Red Crescent Societies (IFRC) and Indonesian Red Cross welcome more donations for the earthquake operation. IFRC would like to establish a regional or global partnership with Hytera. Together, let’s make the world safer!” Hytera will continue to pay attention to the disaster and provide communications support to help reconstruction in the first moment. Hytera, a leading global provider of innovative Professional Mobile Radio (PMR) communications solutions, is committed to fulfilling its social responsibilities by leveraging cutting-edge technology and product portfolio to support rescue and relief operations on a global scale. Hytera played an active role in providing support to emergency response efforts such as the Japan Tsunami in 2011, the Nepal Earthquake in 2015, the floods in Myanmar in 2016, Hurricane Harvey in Houston, Texas in 2017 and Laos Dam Collapse in last month. PT. Hytera Communications Indonesia started its business back in August 2010 as an office of Hytera Communications Corporation Limited. With seven years’ efforts, Hytera Indonesia office upgraded to PT. Hytera Communications Indonesia. Hytera Communications Indonesia has built its reputation as a leading supplier in Indonesian Professional Mobile Radio (PMR) industry, supporting channel partners and clients in different industries, such as Public Safety and Security, Oil and Gas, Civil Aviation, Railway Transportation, Commercial Business, etc. Hytera can be found throughout the country from INP (Indonesia National Police), Kejaksaan Republik Indonesia (Attorney General of Indonesia), Tanjung Priok Port to Pertamina Oil and Gas plant, Wilmar plantation, and Marriott Hotel, etc.